If souping was a hobby I’d likely find myself in a very competitive league of extraordinary slurpers. As a food writer, when dining at fancy Michelin starred restaurants I’m always most inspired by what chefs dream up in a simple steaming bowl. As a home cook who’s always struggled to include vegetables into my everyday, a simple soup is the easiest way for me to incorporate the healthy foods I need into a dish that I actually crave…and it doesn’t hurt that they freeze well too! 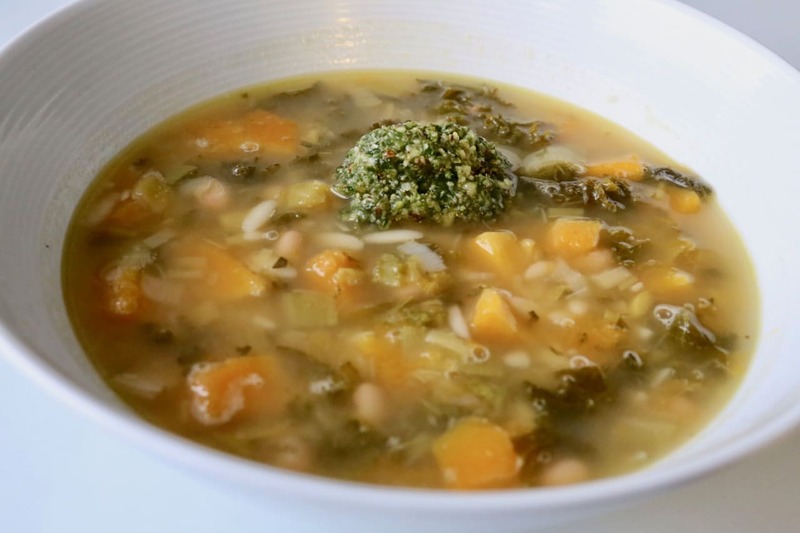 This soup is perfect for a cold winter day and features some of my favourite things: plump pumpkin, nutty pecans, zingy parmesan, subtle leeks, and the muddling of healthful kidney beans and kale. In a food processor, combine kale, basil, and salt. Pulse until kale is finely chopped. With processor running, drizzle in olive oil. Add pecans and garlic and process again, then add parmesan and pulse to combine. In a large saucepan over medium heat, heat oil. Add leeks and salt and cook until translucent, about 5 minutes, stirring frequently. Add garlic and cook for 1 minute more. Add squash, kale, rosemary and stock and cook until squash is tender, about 20 minutes, stirring occasionally. Remove rosemary sprigs. Add beans and orzo and heat thoroughly. Ladle soup into bowls. Top each serving with two teaspoons of kale pesto.